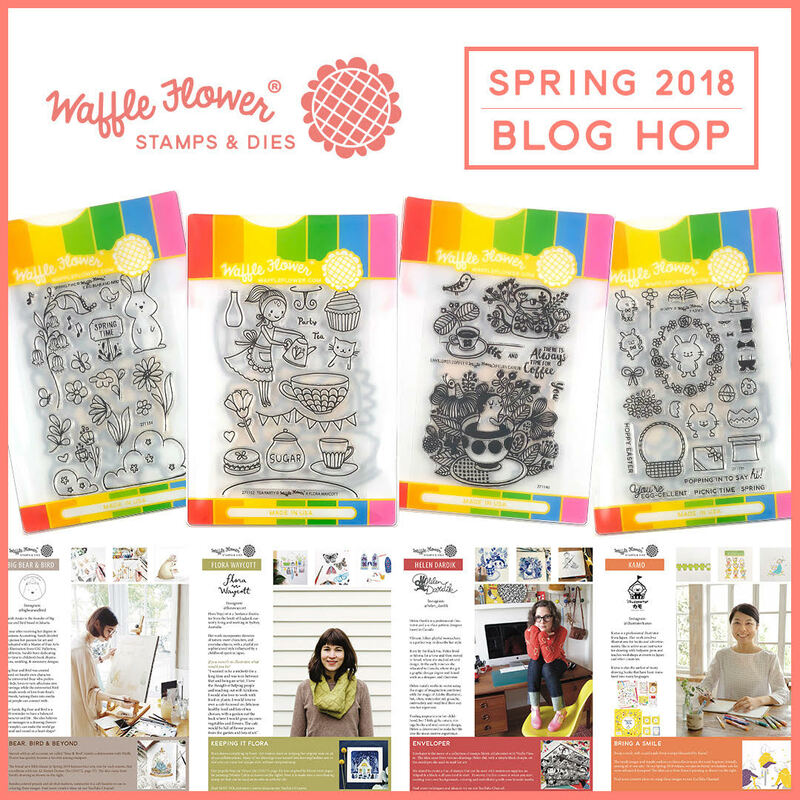 Hello everyone and welcome to the Spring 2018 Waffle Flower Blog Hop! There are so many amazing products in this release it was hard to choose which one to use first :). When I saw the Jungle Birthday stamp set I knew I wanted to try something new for me: a pop-up box card! ¡Hola a todos y bienvenidos al Blog Hop de primavera de Waffle Flower! Hay tantas cosas chulísimas en este lanzamiento que ha sido muy difícil decidir qué usar primero :). Cuando vi el set de sellos "Jungle Birthday" enseguida supe que quería probar algo nuevo para mi: ¡una tarjeta pop-up en cajita! This was a bit of an adventure for me and I made a few mistakes, but also learned a lot! If you want to know all the details, please check the video below or at my Youtube channel! Ha sido toda una aventura hacer esta tarjeta y he cometido unos cuantos errores, ¡pero también he aprendido mucho! Si queréis saber todos los detalles, podéis ver el vídeo aquí debajo o en mi canal de Youtube. To celebrate this amazing new release, Waffle Flower is giving away $25 gift certificates to FIVE lucky winners. Just leave comments along the blog hop 11:59pm ET on 2/25/2018 for a chance to win. Winners will be chosen at random from the comments left on any of the posts on this blog hop and will be announced on the Waffle Flower blog on 2/28/2018. Also, all orders placed by 11:59 pm ET on 2/25/2018 will receive a Mini Location Indicator Die while supplies last. No code required. Para celebrar esta nueva colección, Waffle Flower regala un certificado de 25$ a CINCO afortunados. Solo tenéis que dejar comentarios en las paradas del blog hop hasta las 11:59 pm ET del 25 de febrero de 2018 para participar. Los ganadores se escogerán aleatoriamente y se anunciaran en el blog de Waffle Flower el 28 de febrero. Además, todos los pedidos hechos antes de las 11:59 pm ET del 25 de febrero de 2018 recibirán como regalo el troquel "Mini Location Indicator" hasta agotar existencias. No hace falta código. Aaaaah what a fun and happy card, I love the boxes! :-) And your colours choices and colouring are as usual spot on! How CUTE!!!!! Love your colors! I love the jungle images you used for this particular pop up box. They just scream PARTY TIME! SO cute! Loving your explosion box and the new jungle set is adorable! What a beautiful card! I love the ink blending you did. Great choice of colors! My little monkey, I mean grandson, would love to get that card. Adorable! Awesome card. Love the monkeys. What fun! Super cute project! What an adorable project. Such fun - both the images as well as the interactive element of your card. Thanks for the inspiration. How cute is this card? Very, Very CUTE! It's a party in a box and a fun one at that! So beautiful! Love the box card, and your blending is fabulous! What a super cute card! Love the little monkeys! What an adorable box card! Love it! What a cute sample using such a fun set. Thanks for sharing. I love pop-up box cards and I REALLY love your video showing do's and don'ts on making them! Very sweet end result. Love you video and the pop-up box. Thanks for sharing. Oh my goodness!!! I'm totally in love for your awesome pop-up box card!!! A completely adorable pop up box! And those ombre colors look absolutely awesome!! Totally love it!! So cute! I hadn’t thought of using acetate to elevate the stamped images. Cute card. Love box cards. Love the bright colors and the adorable box card. You did a great job with this card. I love these kind of cards. You just know when someone gets it and it opens up, they are always going to smile. Adorable pop up box. Love the monkeys and the colors you used. Thanks for sharing. Instead of a barrel of monkeys (like the game), you made a box full of monkeys!! Great job and love the 3D look! Wonderful coloring and images! Great new WF release yet again!! What a colorful party! So happy! What a wonderful card! The monkeys are adorable. Oh I love your cute little box card! I need to make another one of these! Adorable! You did a great job! I have been wanting to try a pop up card, but haven't yet. Love the cute jungle animals! Can,t go wrong with monkeys on a box card! That pop-up box is amazing! WOW! I just love interactive gifts and cards. Thanks for sharing. What a fun card. Love those monkeys! Your box turned out so cute! The little critters were colored so well, too! What a bright and adorable pop up box card. Great work! I rather like the clean white and the colored flaps! So CUTE!!! Love the monkeys! Always a learning process for me too! Love how you kept things real! Super cute card and loved the ink blending. love your fun pop up box - good to know that even artists can make mistakes lol. Thanks for showing us how to make this awesome card!!! How cute is that?! Love the ink blending! Even though you feel you made some mistakes, you still made this look so much better than my first try! 😊. This is adorable. I love those monkeys! Thanks for sharing. Adorable card! They fit perfectly in the pop-up. Wonderful card! Your video is so incredibly helpful - thanks! The box card is cute but a lot of work! You used cute critters on your card! Utterly charming! Your tutorial was very helpful. Love the pop-up card you made. This release is fantastic. Great tutorial for the most adorable box card. 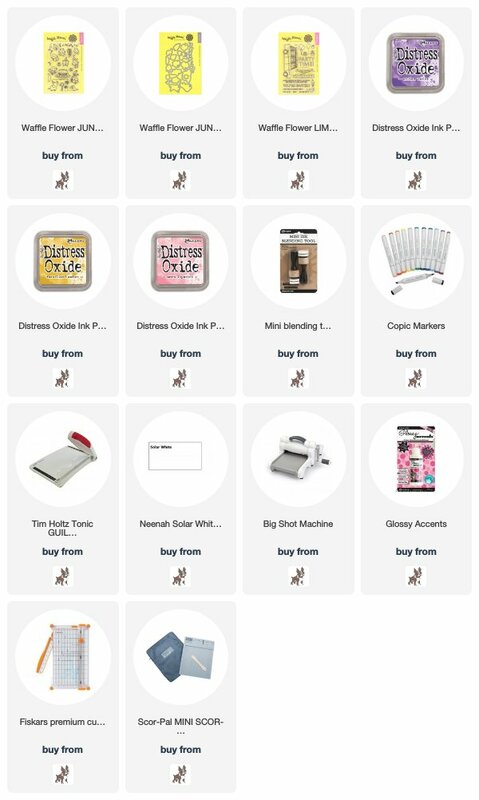 I see that stamp set jumping into my cart sometime soon! I LOVE the little monkeys! Adorable! I think you're really brave to try something as complicated as a pop-up box card for a blog hop! And I really appreciate you sticking with it and showing us what you needed to redo, and what you would have done differently. That's incredibly helpful to me, because it helps me troubleshoot when I inevitably end up with something that doesn't look quite like the videos. Also, I think your efforts were absolutely worth it; the card looks great and the little jungle party is just delightful. Thank you so much for sharing, especially in such an authentic way. So cute? Love the explosion box & your awesome colors! This is so creative! I just love it!! Ideas for my daughter's birthday invites this year. Thank you for sharing. How adorable!! I love those little monkeys and the colors! The Jungle Birthday stamp/die is so adorable. Love your box card. What cute dies in this release. I sure am loving the monkeys! Lots of fun monkey business going on in your sweet interactive card! Very cute! I love box cards! How awesome! Thank you for the inspiration! Awesome pop-up box card, love it! I love your pop up jungle BD card--I made a similar one for my daughter last year--this stamp set is perfect ofr this! This is a super cute card! Love the sizing of all the critters perfect for this pop up card! What a fun card! I love how they pop out of the box. I love your pop up card! You did a good job for the first time, I haven't braved one yet but will try! There are so many great new stamps and dies in this release, it's going to really fill up my wish list!! I love your card. It's super cute! That box card is so fun and really spectacular! I just love all the cute jungle animals. That box is brilliant ! thanks for showing how to make a pop up card with out a die! this is so adorable!!! one of my fave sets from the release! What a fantastic pop-up box card! Adorable and so beautifully executed. Super project! Your colors really reflect how fun those jungle critters are. Gorgeous card. I prefer the ink blending over pattern paper. Looks awesome!! Oh wow I love the colours you chose for the box! Very cute Amanda - love the end result. Love your pop up box card! This jungle birthday set is too cute, great job! Such an adorably sweet pop up card!!! Such a cute way to use these stamps and dies! Your coloring is terrific. Cute idea to make a jungle box card. I like the colors. I love the box... Pero me gusto mas ver como corriges tus errores, me encantan tus videos, eres super natural y sencilla, ademas contigo pierdo el miedo a equivocarme. Love all your videos ans ideas!!! I know you said that you would use colored cardstock or papers from a paper pad, but the ink blending really sets off the images, Amanda. I haven't seen the box done this way before, but I REALLY like it. Your project is wonderful and ANYONE would be in heaven receiving it. Adorable box card! Love the jungle theme! Pretty coloring and details! Haha. This card makes me smile! I just love your work!!!!! Beautiful! I don't know how you get your backgrounds to look so soft and even. When I try to use stamp pads and daubers I end up blotching things up. Love your wonderful ideas. Your coloring and designs are awesome. Adorable! I love the colors you used. Thank you for sharing all your tips and suggestions. I LOVE your pop-up box card ! I don't think you made any mistake ! It is perfect ! All the critters are so cute. Thank you for sharing. Super cute:D Love the pop-up box. This is an adorable project! You created such a cute scene and the colors are so bright and happy! I love all the little jungle characters! Such a fun pop up card, love it. Thank you for sharing. I love your card! it is really beautiful! What can I say, just love the box card. Fabulous. Oh my goodness, you are so creative. Love interactive cards. Thanks for sharing how you made this card and particularly for including your mistakes. Such a fun box. The recipient will love it! What a beautiful colour blend! Love your pop up box. Pop up boxes scare me. I love pop up box cards and yours is great! I love that little toucan. So adorable!!! Thanks for sharing and a chance to win. So cute! Who wouldn't love to receive that! people populating your box. Darling. what a great pop up--and these little monkeys are just the cutest! What a FABULOUS card - especially since it is your first pop-up box. You have inspired me to make one soon, and I will be watching Laura's tutorial, too - thank you! Great idea for such cute images. Wow! What fun cards! Love them so much! Thanks! These monkeys are too, too cute! Love them! And your pop up box card is gorgeous. Well done! What a cute card - love all the critters. I am loving these dimensional cards! Love this cute and colourful box card ! So many wonderful new stamp sets to choose from! This is an adorable box card. Awesome project. I love the look and fun-ness it gives. I love those darling images. The monkeys are just too cute. The elephant looks like fun along with the bird and vines and leaves.. what more do you need. Looks like this set has it all. I love your scene. Super cute. Love the colors and the distressed background. Your pop-up box card is absolutely adorable! You did a fabulous job and your coloring is just beautiful. Thanks for your video tutorial, enjoyed it! What a bunch of fun card! What an adorable box card, so glad that you were honest to tell us and show us your mistakes, your box was very colourful and the cute animals looked fab. Thank you for your hard work. What a fabulous box card...I adore the cute jungle friends. Great job on the pop up box! Love the jungle animals. What a great interactive card! Thanks for sharing! Excellent pop-up card!! I have yet to try one!! What a darling pop box!! I love the critters, I love the colors, I love it all!! I love the pop-up box card! The monkeys are so cute! Adorable pop up box card! SQUEAL!! LOVING LOVING LOVING the New Release and your AMAZING Pop Up Card!! THANKS for sharing the Video too!! Have a FABULOUS WEEKEND!! That pop card is fabulous. This is such a versatile release. Very cute! I've made several of these, and lots of mistakes, too. There's just too much to think think about with this one! Y yo soy vieja! it turned out great! always luv to use acetate to lift up the elements too! What a fun scene! Love the monkeys and the great inking! Love your box card, so pretty too!